A general strike, riots, tear gas and petrol bombs marred Belaid’s funeral, threatening the country with a new revolution. The army watched over tens of thousands people, as opposition leader Chokri Belaid was being laid to rest in Tunis. Thousands mourners from all over Tunisia joined the funeral procession of secular opposition leader Belaid, who was well respected and very popular in the country, RT’s Maria Finoshina reported from the city of Tunis. Finoshina, who was in the middle of the crowds of mourners, said many people openly accused the Islamist Ennahda party of Belaid’s death and chanted anti-government slogans. “Down with the system, we can’t stand Ennahda anymore,” “Ghannouchi assassin,” “We are all Chokri Belaid,” the people chanted. Belaid, who was shot dead on Wednesday, was an extremely vocal, very harsh critic of the government, particularly of the ruling Enhanda party, the Tunisian branch of Muslim Brotherhood. The military provided security of the funeral ceremony, and army helicopters were watching over the Tunisian capital. While the police have lost people’s trust in recent clashes, the army still enjoys respect among Tunisians. Both the police and the army in Tunis are still on alert on alert, expecting the peaceful procession to be followed by clashes. A nationwide strike called by the labor unions in protest against the assassination of Belaid has paralyzed the country on Friday. All Tunis Air flights have been canceled. It comes amid the ongoing clashes in the central Tunisian town of Gafsa, where police fired teargas to disperse petrol bombs throwing protesters. 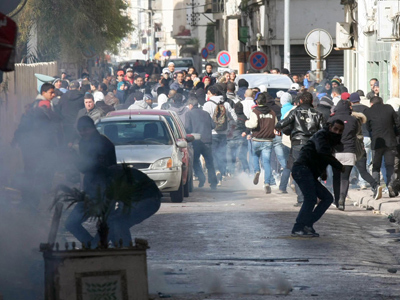 Teargas was also sporadically fired in Tunis to clear the streets of hundreds strong crowds. Small clashes broke out near the cemetery as groups of stone-throwing young men tried to steal some of the mourners’ cars and set two of them on fire. Police used teargas to push the gangs back, scattering both attackers and mourners. Arab Spring déjà-vu is being felt in Tunisia as Belaid’s funeral has emptied the capital and filled the streets with angry protesters throughout the country, Finoshina reported. “It’s a real crisis here… a turning point for the country’s history,” Finoshina said. With crowds of protesters demanding the government step down two years after the Tunisian revolution, the situation is becoming "very dangerous," she added. “This is a political assassination. 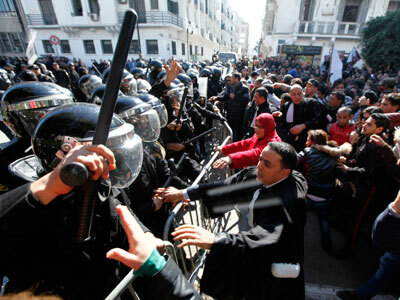 And that means that the repression and violence is not over,” a protester told RT. “People want change again. Slogans of revolution, of democracy protecting working class and poor people didn’t work, we can’t see it,” Belgacem Ayari, the vice-president of Tunisian workers union told RT. Belaid’s murder is a sign of “chaos,” to which the country is now “very close,” Mohsen Mazoug of Nida Tunis opposition party told RT. Dialogue is urgently needed, otherwise there will be “more tears and blood,” another Tunisian opposition leader told RT’s Finoshina at the funeral. But Tunisia instead seems to be facing a political deadlock, with its society, government and even the ruling Ennahda party divided. Following Belaid’s funeral, the country’s Islamist Prime Minister Hamadi Jebali reiterated he will dissolve the government and form a cabinet of technocrats to avoid mass unrest. The move has already been rejected by his own party, with Ennahda’s vice-president saying Jebali never consulted them. No one has claimed responsibility for the killing of Belaid. Ennahda’s leader Rached Ghannouchi told Reuters his party is “totally innocent of the assassination,” denying the family’s and the protesters’ accusations. One of the leaders of the secular opposition Nejib Chebbi also blamed Ennahda members for Belaid’s murder, saying the Islamist interior minister knew Belaid was threatened but did nothing. 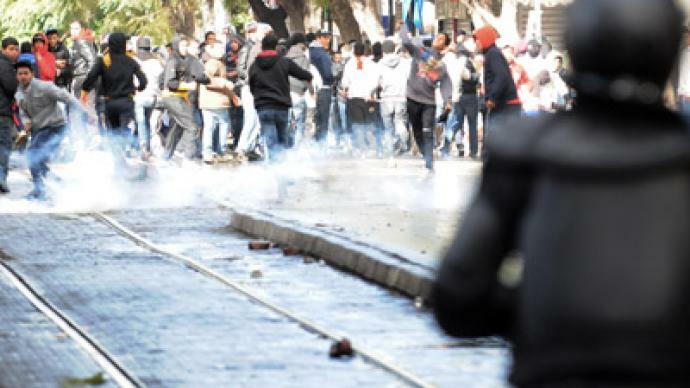 The fears Belaid voiced represent a view increasingly held by many Tunisians, who are not willing to give back the freedoms won in the 2010 revolt that marked the beginning of the Arab Spring. Others fear that economic and political uncertainty combined with street protests would prove a catastrophe for the country that is heavily dependent on tourism. “Tunisia is entering a profound crisis, a crisis of the credibility of the existing government and arrangements for holding power and a massive discrediting of the way in which they operated,” Firoze Manji of the Council for the Development of Social Science Research in Africa told RT. There’re signs that the situation could “easily disintegrate into… civil war,” Manji said. 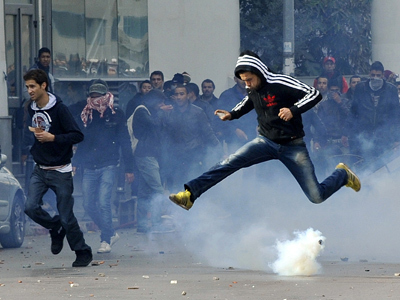 “I think we’re entering a new phase in the revolution in Tunisia. And with revolutions you never know what the outcome is going to be,” Manji added, stressing the uncertainty the country is facing. Much will depend on the government’s ability “to prevent the resolution of political differences by violent means,” Manji said, referring to the possibility of further killings. Some Islamist groups’ websites openly celebrated Belaid’s death, and that is “quite terrifying,” he said.